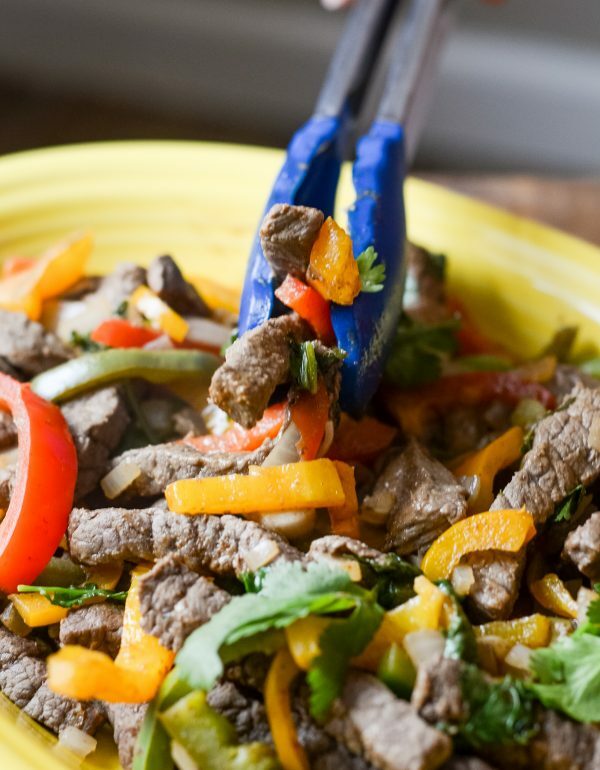 Make dinner delicious with these Easy Gluten-Free Skillet Beef Fajitas! I have fallen in love with fajitas. I’m not sure what has come over me lately, but I honestly could eat them every day! They are just that tasty. 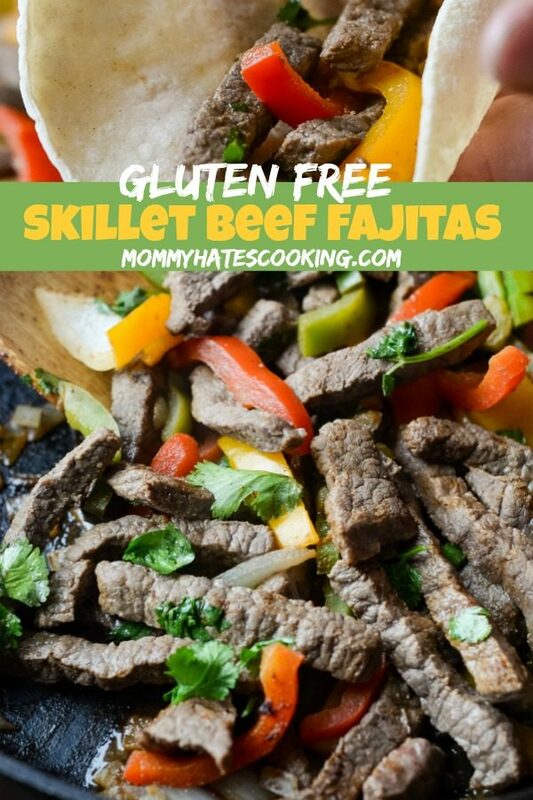 I love to make these Gluten-Free Skillet Beef Fajitas on Taco Tuesday nights, it’s a nice way to mix it up a little bit. 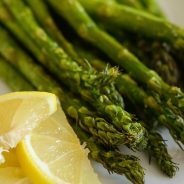 It’s also a great way to add lots of fresh vegetables to your meal. We love to add in a variety of peppers and onions along with cilantro too. 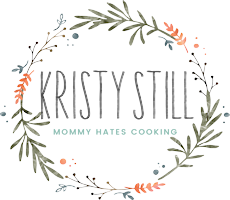 I know I have been posting a lot about the Air Fryer and you can definitely make Air Fryer Steak Fajitas too; however, today I’m going to spread the love with my cast iron skillet. It’s been a little bit lonely lately. 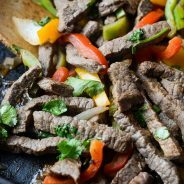 What meat should you use for Beef Fajitas? 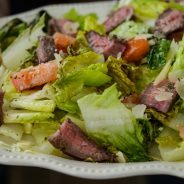 Flank steak is generally what would be most recommended, and I would definitely agree. I noticed though at the store a few weeks ago that many have specific fajita meat. I decided to pick up the fajita meat that was specified because it was already cut, so that meant all I had to do was toss it in the pan and cook it up. If you do not have that though, flank steak is more tender and a great choice. It does not have the same flavor though as skirt steak so that is the next option. Skirt steak can also be used it is just a little bit tougher than a flank steak. Regardless, either one will be a great option and you’ll be seasoning it as well. How do I cook Fajitas on the Stove? The cast iron skillet is my favorite option for fajitas on the stove. It really gives them that grilled flavor in a way even though they are being cooked indoors. The steak will be cooked in the skillet first and then you can set it aside while cooking the vegetables to let it rest a bit. Once the vegetables are cooked, I like to add the steak back in to warm it up a bit and add a little bit of lime juice too. It gives it all a nice flavor. Although it’s not necessary, I highly recommend doing a nice Fajita Marinade to your steak before you prepare it. This really enhances the flavor. This Fajita Marinade on All Recipes is a great choice and you can always do your own as well. 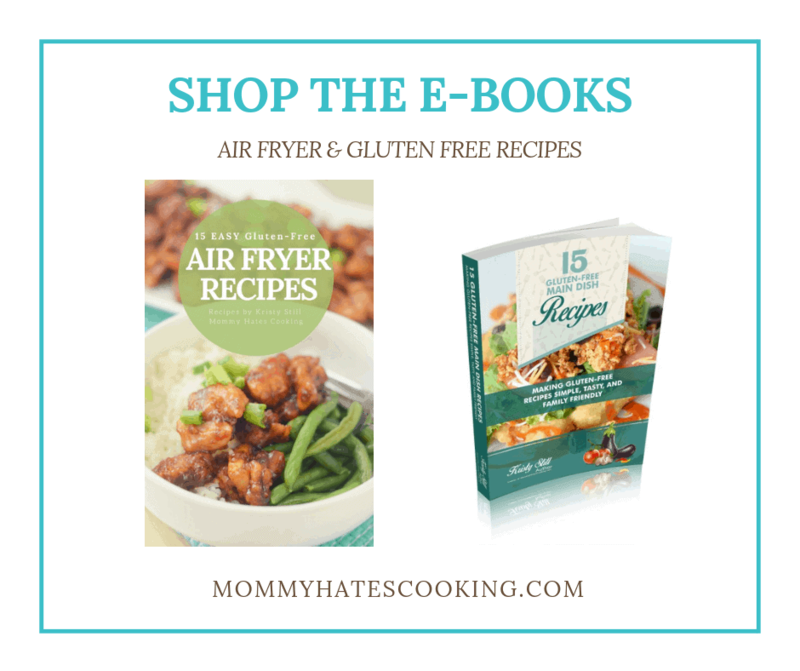 What Gluten-Free Fajita Seasoning should you use? 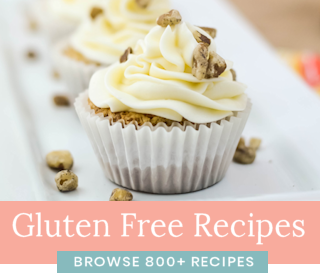 There are actually a few you can choose from at the store with the gluten-free seasonings. 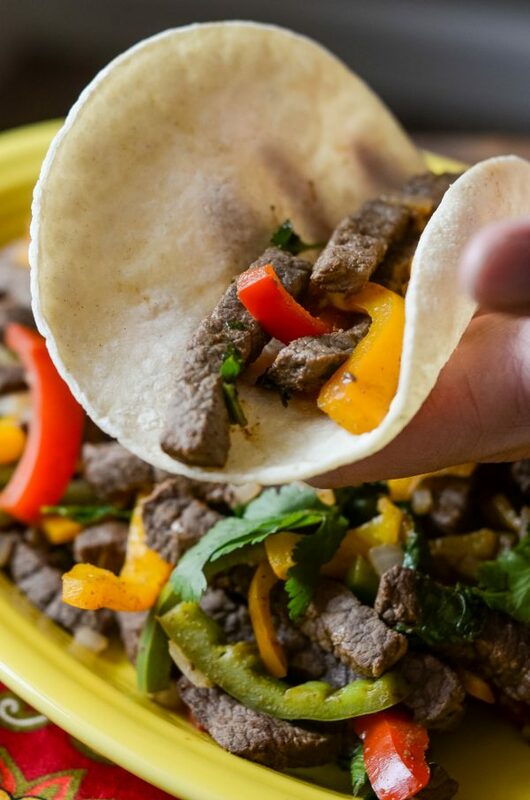 If you prefer homemade though, this Gluten-Free Homemade Fajita Seasoning from Lynn’s Kitchen Adventures is my favorite. This seasoning can be made in bulk too so that you have it on hand anytime you are ready to make fajitas. 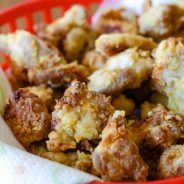 It makes this a quick meal! 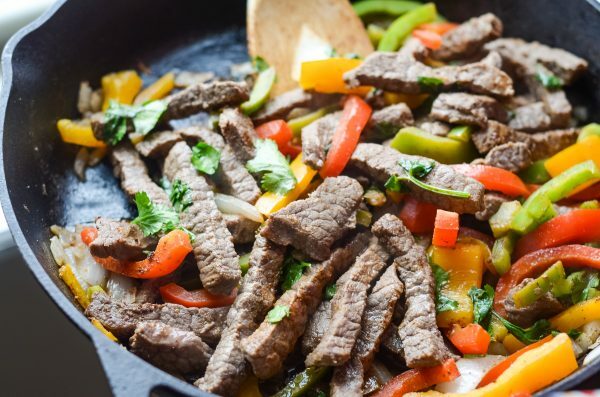 What do you need for Gluten-Free Skillet Beef Fajitas? 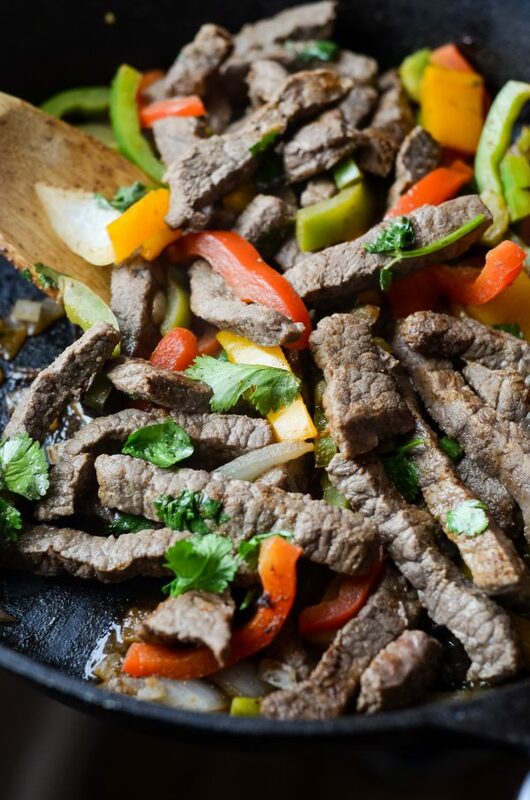 Now we are ready to make these Gluten-Free Skillet Beef Fajitas in just minutes! Are you ready for a bite? I know I’m craving them now. 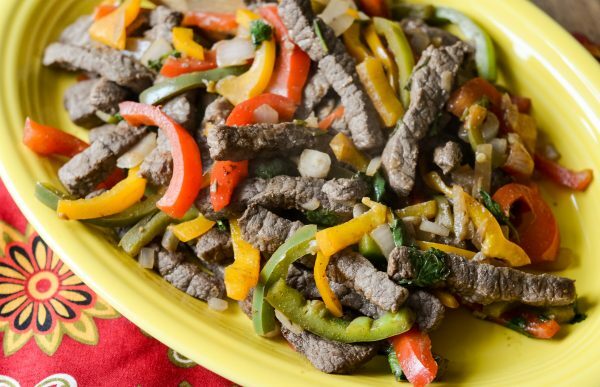 Make a delicious dinner with Gluten-Free Skillet Beef Fajitas using fresh vegetables and ingredients. Cut the steak against the grain if needed into slices. If you buy the specified fajita meat, it should already be cut. Begin by spraying a cast iron skillet with olive oil spray and add in the steak. Cook this for about 3-4 minutes on each side. Mix with the fajita seasoning and water and let it soak into the steak. 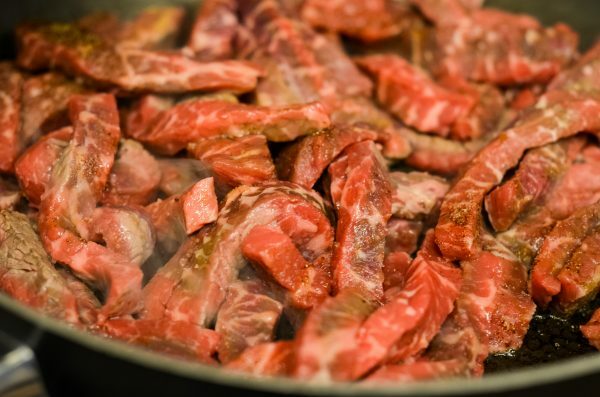 Once soaked in remove from heat and set steak aside. 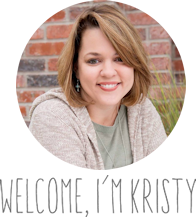 At this point, clean the skillet and reuse or use a separate cast iron skillet. Spray the skillet with olive oil cooking spray and add in the veggies. Simmer these for 5 minutes or until soft. Add the steak back into the skillet and mix with veggies. Squeeze the juice out of half a lime evenly over the meat and veggies. Stir to make sure it warms up and is sizzling. Top with chopped cilantro. Serve in a warm tortilla with your favorite sauces like salsa and guacamole. This is not a sponsored post; however, I do have an ongoing partnership with the Certified Angus Beef ® brand and have used these particular pictures to promote their beef.